Happy one year blogiversary! It has been a great year! I know the next year will be even better! I discovered your blog a few months ago. 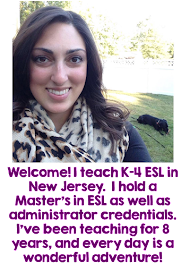 With this year being my first year teaching ESOL in Virginia, I found it to be one of the best ESOL blogs I have come across. Happy Anniversary! Happy blogiversary!! Love the new words our technology has created! How exciting that you are still going strong sharing your knowledge. Super impressed by your awesome giveaways!! Thank you so much!! Here's to another year! Happy blogiversary! Congratulations on your first year of blogging! May you have many more. Good luck with your giveaway!